He leaves Saarijärvi and his family behind and embarks on his journey or rather an adventure across the Atlantic. What does his father Otto think about watching his son now in turn leave homeland? Otto knows better than anybody what it is like to leave alone for another country and not see your loved ones for a long time. Otto also knows the benefits, financial and otherwise of these life changing experiences. William also knows what it is like to stay behind and miss his father for all the years Otto was away living in United States when William was a boy. Still he leaves. From how far back in the past of the family tree does this "restless gene" originate? First he travels from Finland to Copenhagen Denmark and then boards the Transatlantic Steamer SS. Frederik VIII from Copenhagen - stopping briefly at Oslo on the westbound voyage - to Halifax. William is carrying with him 300 (Canadian 1926) dollars. The Steamer is owned by a Danish shipping company Scandinavian America Line which also has three other modern immigrant ships. On SS. Frederik VIII alone over half a million immigrants sailed across the Atlantic between 1914 and 1935. His contact there is a friend Sulo Ranta in Sudbury. There are families, couples and several young men also on the steamer from the same small area in Central Finland emigrating to Canada. Eino Kaltiainen, 22 years, from Karstula is one them. He lists the same friend Sulo Ranta in Sudbury as his contact person. friends or other Finns who were on the same ship coming over to Canada? It is not known how long it takes for William, Eino and the rest of them heading for Ontario to get there from Halifax. It is also not known how William ends up working in the nickel mines. On the immigration records he has stated he will work in Ontario as a farmer. William's daughters remember the phrase "nickel mining" from their childhood. It is (almost) certain that William works first at Inco (founded in 1902) and/or later possibly also at Falconbridge both of which are major nickel mines in Sudbury, Ontario. 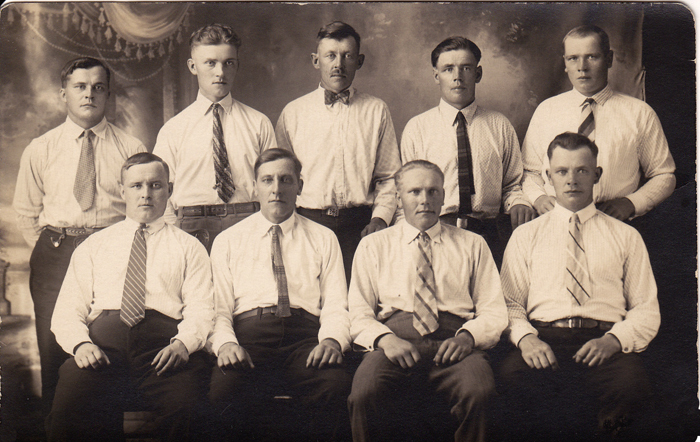 William sitting on the right, 1st row. Who are the other eight men? Friends? Miners? William buys a Kodak box camera (made by the Canadian Kodak Company in Toronto). During the warm summer days after work, weekends or days off he goes to nearby Pike Lake with friends. 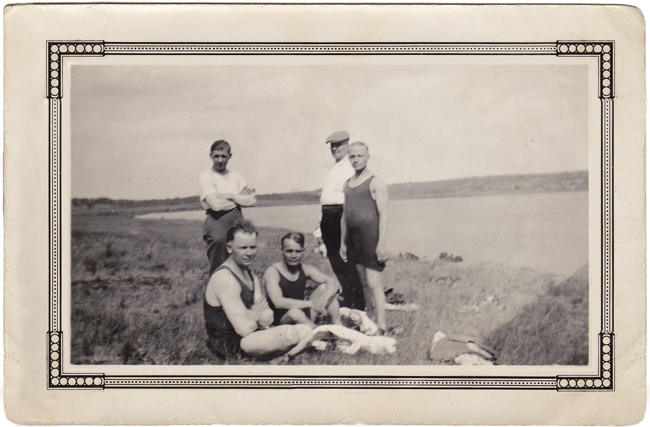 In the photograph below the tallest man standing on the right by the lake is probably Pitkäaho (first name unknown). He lives in Ontario but also visits William in Central Finland after William has moved back permanently. William's eldest daughters remember William speaking English or Finglish (mixture of English and Finnish) with his visiting Canadian-Finnish friends and also sometimes on the phone as well. On the left is William sitting down hands crossed and in his swimwear. Behind him is Martti Poikonen (standing on the left), William's wife Aino's brother. Martti is three years younger than Aino. Somehow he also has ended up in Sudbury - following William's footsteps perhaps? But who are the other two men? The photo is taken late 1920's or early 1930's. Back in Finland William's son is growing up without his father. By the time he sees his father again he will not remember him. After all he was only a baby when William emigrated to Canada. What is Aino thinking about in the mornings, afternoons and evenings week after week and year after year? How much can one miss another person and still be able to go on with one's daily life? 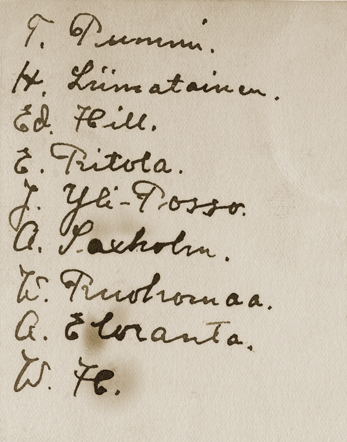 Below in William's handwriting: My greetings (= terveiseni) and his signature. Hard work in the mines has paid off. He has made enough money and is now ready to have his family with him in Sudbury. He makes the necessary arrangements to travel to Finland. He is excited to have Aino and his son finally living with him in the new country. In the photograph below William (left) looks happy and hopeful. On the right is Martti, Aino's brother. The lady in the middle is not known. William leaves for Finland, just a short trip, he will be back soon.